When you have way too much money to spend, what do you do with it? Some of us would love to be in such a position, since it would be able to solve many of our material “problems”. Well, imagine for a moment that you are one of the tycoons who regularly appear on Fortune magazine covers as well as other business publications. With a whole lot more dough you can spend on frivolous items, what would be at the top of your list? We know that getting a good night’s rest is extremely important, so why worry with sleepless nights when you can always sink your head down onto a soft pillow and mattress? 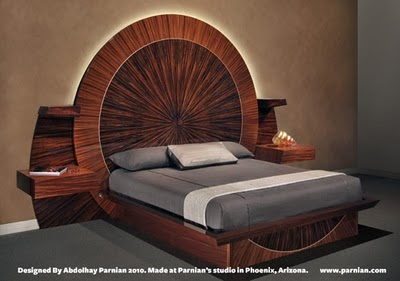 You can do so with what is deemed to be the most expensive bed in the world, thanks to Parnian Furniture from Arizona. After all, the company has already come up with the world’s most expensive desk, so why not expand on their portfolio? Designed and created by the company’s president Abdolhay Parnian, the main intention when developing this bed was not to make it the most expensive in the world, but rather, to design something which does not look like anything folks have seen before, where it is supposed to elicit a feeling of “Wow!” the moment you lay your eyes on it. The design itself took more than two years to create, while the craftsmen at Parnian Furniture took more than 8 months to create this intricate piece of fine art by hand. The end result is stunning to say the least, and yet Abdolhay is now working on a much more elaborate version for a private client. Just how expensive is it? For starters, it will retail for $38,000 a pop, with the final price tag easily touching a whopping $210,000, depending on features and materials selected. Other options that are available in case you’re feeling rather generous would be integrated iPad holders, charging stations, pop-up and swivel TVs and computer monitors, hidden compartments, gold and stainless steel detailing and custom handmade mattress options with all natural materials include wool, cotton, latex and horsehair.